Has ever happened to you to see people in the street as if they had just woke up, didn’t have time to go through the daily ablutions and catapulted themselves into a new day? It has happened to me. I think those people are afraid of mirrors and the revelation they could experience if they see their image reflected through the “looking-glass”. Fashion, always aiming to new experiences, has determined the style of an era, its colors, shapes and forms, sometimes through the invention of many accessories of minor importance. Some of the accessories considered “amusements”, were in high demand, highly paid and sometimes reputed indispensable. All those secondary accessories that fashion has created through the centuries, we still find them attractive today and have transferred them into our homes. Mirror is one those accessories. From the 12th century to 17th century mirrors took a stage in women fashion. With the invention of the glass soon followed the invention of mirrors too. By applying a heavy coat of aluminum or silver to the backside of one sheet of flat plate glass, the reflective surface was invented. (Above: The book “Le Bon Genre” was published 1817 . 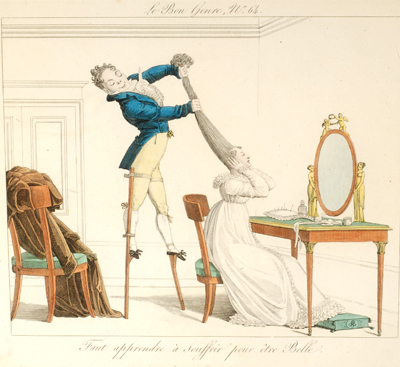 Vyvyan Holland, Hand Coloured Fashion Plates 1770 to 1899, p. 51). The most preferred mirrors were the hand mirrors and the pocket mirrors. Women carried mirrors on gold chain as necklaces, or tied to their waist and even attached to the middle of their hand fans. Made of highly decorative materials as ivory, or tortoise-shell frames, embellished with engravings on silver with a gold tone, mirrors taught women the art of vanity and coquetry. Looking at oneself in the mirror became such an important practice of vanity that mirrors became larger, oversized and made to hung on walls to get the full effect of the entire body. 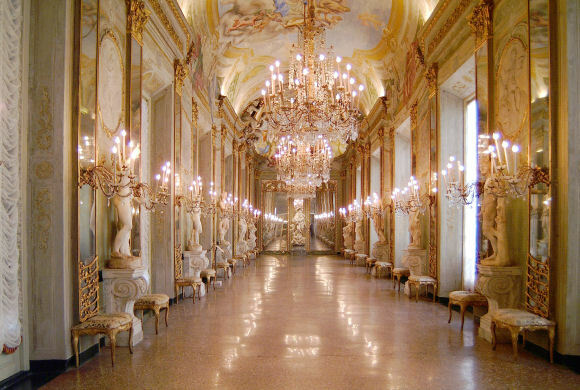 And that is how kings and queens, castles and aristocratic homes decorated at least one of the many rooms as the “Room of Mirrors” generally used for grand gala and dancing halls delighting us with their beauty to these days. Many artistic craft shops were born through the centuries to keep up with the demand of several fashion accessories, some of which have unfortunately disappeared to give way to mass productions. In Europe it is very common to hear people since a young age speaking of beauty: “bello” – “che bello” – “come e’ bello” – “che bellezza” – “che finezza” – all adjectives that show how appreciative people are about beauty or fine things and how much they like to fill their own life with these objects. The purpose of mirrors is to reflect and to double any image. They should be placed anywhere they can reflect and double the beauty, therefore carefully think of their placement when you hang mirrors on the walls. If placed in a corner they make the opposite corner look larger, especially if in the opposite corner there is a light source nearby, the lighting reflected in the mirror will illuminate the room in such a way that the space will appear visually larger. As a designer, I can create the unexpected by placing mirrors in strategic places and I am not afraid of placing them in uncommon areas. By grouping many together, regardless of shapes and forms, I can recreate the large window effect in rooms with only one small window, thus reflecting the natural light coming from that one window. To turn the area under a staircase into a lively area, I can place mirrors with lighting shining into with the aids of plants disguising the fixtures. In the summer time, when the fire is off, a fireplace is beautiful with a mirror insert and lights inside. The fireplace will no longer be a black hole, but a transformed tri-dimensional space. Tall mirrors placed vertically on the walls can also reflect heat. Sun reflected in mirrors produces heat and then fire, be careful not to burn the house down. Composition of mirror with frames of all shapes, sizes and color look stunning together and they are so dressy. The “looking-glass” will tell the truth about ourselves. Before I speak to an audience, I go to my favorite mirrors and question it. I see how I look, what aspect of myself to improve, what gestures to do or not to do. Let the looking-glass be your friend, it will keep all your secrets and it will tell you all your mistakes, then it is up to you to fix them. In most cultures there is a common belief that when breaking a mirror, seven years of bad luck await for you and if you believe, it will happen. Let me help you with all your decorating or remodeling dilemmas, or needs. Together we can go further and my designing adventure can continue on. Valentina Cirasola, the principal designer and owner of Valentina Interior & Designs is a trained designer and has been in business since 1990. She works on consultation and produces design concepts for remodeling and new home designs; décor restyling and home fashion. “Vogue Italy” magazine and many prominent publications in California featured Valentina’s work. She also has made two appearances on T.V. Comcast Channel 15.